Enter the stunning fantasy world of Mid-Heaven in the magical action epic from the team behind the spectacular 'The Warrior'. 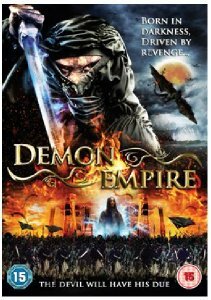 Featuring some of the most jaw-dropping kung fu action captured on film, DEMON EMPIRE is a visual treat and includes incredible designs by the Academy Award-winning team behind Kurosawa's 'Ran', 'Hero' and 'House Of Flying Daggers'. In the limbo world between Heaven and Earth, a fearsome demon lord readies his unholy forces for the time when the gates to the human realm will be shattered. As the prophesised hour draws near, the demon hordes hunt a beautiful angel who has the power to prevent their destiny from being fulfilled. Only a wandering human warrior (Jung Woo-sung, 'The Good, The Bad, The Weird'), who's become trapped in Mid-Heaven, and his magical demon-killing sword stand in their way.